Give Yourself the Chance to Catch Your First Wave! 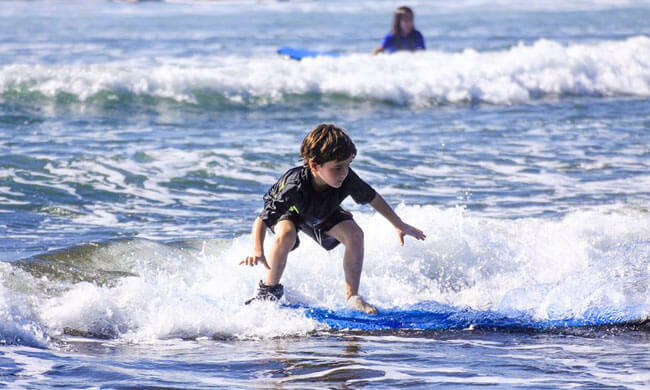 Surf lessons in Jaco are a perfect chance for you to learn how to surf! This first-time lesson is a workout but will prepare you for everything you need to know to get up on that first wave. Take a quick ride from your hotel and find yourself at one of the best learning sites for surfing in the world: the caramel sands of Jacó Beach. These crashing waves promise days of serious challenges for beginner and also intermediate surfers. You will meet your bilingual guide who will give you all the know-how for beginners while still on shore: surfing fundamentals, etiquette, safety, wave dynamics, paddling skills, surfboard positioning, maneuvering, and proper stand-up and riding techniques. These tips and recommendations will help you feel confident as you paddle out through these warm waters. By the end of the lesson, most beginner surfers will find themselves riding their first waves during this first class! Regardless, you’ll have a lot of fun and make a lot of memories. A professional photographer is available to capture these moments for an extra charge. This tour is great for both children and adults, anyone who is interested in having fun in the water. You should know how to swim. After your lesson, feel free to stay at the beach and explore on your own or use transportation back to your hotel. Your tour includes: Transportation, surf board, rashguard, bilingual guide, water. What to bring: Camera, sunscreen, insect repellent, sunglasses with croakies, change of clothes, a towel. What to wear: Swimsuit, sandals, comfortable clothes. *Extra transportation fee applies for hotels outside the Jaco area.